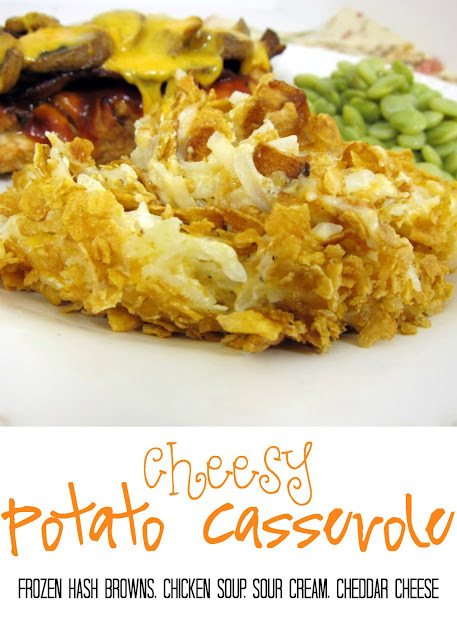 Cheesy Potato Casserole Recipe - frozen hash browns, cream of chicken soup, sour cream and cheddar cheese - freezes well for a super quick side dish. This recipe is from one of my favorite blogs,Cooking with Karin, and would be a great addition to your Easter dinner on Sunday. We love potato casseroles and this one was no exception. It was creamy, cheesy and, most of all, delicious! This makes a ton (10-12 servings). I always divide the potato mixture between 3 foil pans and freeze two for later. It is such a timesaver! Combine sour cream, cream of chicken soup, pepper and cheese in a large bowl. Fold in the hash browns and pour into a 3-quart casserole that has been sprayed with nonstick cooking spray. Combine the melted butter or margarine with the crushed corn flakes and sprinkle over top. Bake for 45 minutes. This stuff is my favorite potato dish! I am making it for Easter dinner! We have this every Easter and Christmas, but we use cheez whiz and cream of celery. YUMMMM!!! I have a recipe very similar and it is sooooo good. Next time I make it I am going to add chopped chicken and make it an all in one meal. Yum! Everything I have made from you, is amazing. Thank you so much for sharing your recipes! My hubby works for a potato company so I get a lot of free potatoes. It pretty awesome. Always looking fro recipes like this. It looks and sounds delicious and my eye was really caught by the piece of meat behind it. I have to believe the leftover casserole would be great for breakfast topped with an egg. It's that chicken in the back that looks so good to me right now! Kate - that is our Smokehouse Chicken. It is awesome!! That is an oldie but a goodie. Everyone has their own version and name. My sister calls the Funeral Potatoes because she always brings them to the funeral luncheons. I know it's morbid! But we all love them. I prefer to call them Harvest potatoes. Cheez Whiz has a storied and amazing history. It was invented by the same guy who developed McDonald's French Fry process. Check out the original promotional pamphlet that introduced Cheez Whiz on my blog: http://thevodkaparty.com/new-cheez-whiz-believe-it-or-not-there-was-a-time-before-cheez-whiz/ It’s overflowing with incredible original Cheez Whiz recipes. ummm, bet this will be perfect to go with our pork tenderloin. Thanks so much. This a staple at our house (its an Idaho thing) just to add to your already awesome recipe, bake at 400 degrees it makes them crispy on the edges! In WV we call this "Hash Brown Casserole. Instead of sour cream we use french onion dip. It makes it more Kid friendly! Is there anyway to make these amazing potatoes in a crockpot or roaster?